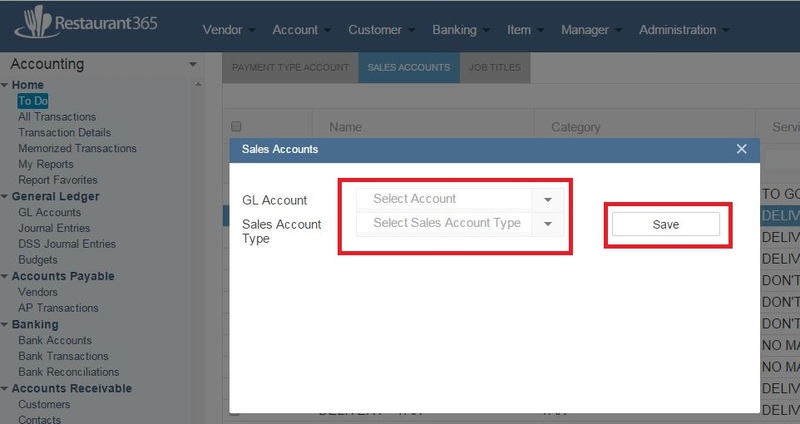 System Setup - this displays if any legal entity in the system has a discrepancy in beginning balances such as the open AP transactions entered at go live don't equal the AP gl account beginning balance. AR balance is another example of a discrepancy that might show in this tab. Additional instructions for using the window for Payment Type Accounts, Sales Accounts, and Job Titles is listed below. A new Pop-up will appear. For Payment Types - Select the GL Account and Payment Group. If you want the item to be an exception on the DSS, check the 'This is an Exception Type' check box. You may also have the payment type cosolidated on the Flash Report, check the 'Consolidate on Flash' check box. Select save to save the update. Repeat these steps for each payment Type that needs to be assigned.